Like a rollercoaster ride, the revision process is full of ups and downs. One moment, it feels like everything is going well. The changes you're making are definitely making the story stronger. Then a few minutes later, doubts creep in. Is what I want to do even working? Have I really addressed the doubts of my critique buddies? Is this new plot direction going to work? What if it ruins what I already have? 1. It feels like your character is running on a hamster wheel, going around and around and not getting anywhere. Remember, the tension and conflict should be increasing. 2. The scene you just reworked bears a striking ressemblance to another scene earlier in your novel. 3. You fall asleep while you're writing. Maybe there's a little too much of that description or interior dialogue? 4. A never-before-seen character or object appears in your novel just before the climax to help get your protagonist out of a tricky situation. If your setting isn't Hogwarts, you might be in trouble. 5. After reading your latest chapter, the reader has a clear image of how your main character slurps up ice cream, eating out all the chocolate bits first and licking whipping cream off the spoon, but has no idea how your character got away from the evil monster and ended up in the ice cream shop. Oops! Go get a real sundae and then get back to the keyboard to show those key plot events! Do you have any great revision tips to help get through the process? We MiGWriters were discussing one of our works in progress, and Car brought up the subject of her main character being an unreliable narrator on one plot point. Would it play for middle grade? I love unreliable narrators, and I can think of examples where it works in middle grade. Take Diary of a Wimpy Kid. We know Greg isn't a great friend to Rowley, even though Greg is convinced that he is. Middle grade readers see the difference between Greg's actions and his thoughts. For a classic example, in the Secret Garden, Mary's ornery personality is so clear that we know her surroundings aren't nearly as disagreeable as she says they are. The trick is to present both what is really going on and what the character is thinking, and to have some reason why the character sees the world as it isn't. I think if you can pull that off, you can have a successfully unreliable middle grade narrator. There are two traps you don't want to fall into. If you only present what the character thinks and why they think it, but don't show what's really going on, you have a mystery on your hands, gang. My son has read a lot of the Boxcar Children books, and they all use that basic plot: kids meet mysterious character, have reason to think he's shady, and in the last chapter, all is revealed and they find out the mysterious character is really their long lost cousin. The second trap is the idiot plot. You present what the character thinks and what is really going on, but you never show why the character has reason to think what he thinks. That leaves the reader scratching his head, wondering how your character can't see the truth. We need to know why Janet thinks Jack is making a pass at Chrissy when he never has before. Since we never find out, and Janet has no reason to think Jack's motives have changed, Three's Company descends to farce or idiot plot. None of this might be helpful to Car, but I feel good having analyzed that into the ground. In summary, your unreliable narrator works in middle grade if you clearly show 1) what the viewpoint character thinks; 2) why the viewpoint character thinks it; and 3) what is actually happening instead. I'd love to hear your counterarguments and/or other examples of unreliable narrators in middle grade. 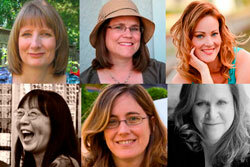 Welcome to the home of the MiG Writers, a group of six middle grade and YA authors who critique each other's work as well as post about the craft and business of writing for young people: Kate Fall, Christina Farley, Susan Laidlaw, Andrea Mack, Debbie Ridpath Ohi, Carmella Van Vleet. All entries protected by copyright. Watermark theme. Powered by Blogger.